On 15th March 2016, the Swedish Research Institute in Istanbul (SRII) highlights the Religious Track of the Cyprus Peace Process (RTCYPP) as part of its lecture series under the title “Can Religion Contribute to Peace in Cyprus”. Peter Weiderud, one of the initiators of RTCYPP describes the process, the ‘lessons learnt’ and shares his experience working for peace in Cyprus with the religious leaders of the island since 2009. “The religious leaders of Cyprus have learned that it is very difficult to reach results in a situation of conflict, if they only address their own needs and in a national context. However, when they talk together, and address principle concerns, which are in line with human rights law, they can count on international support for their claims. And when they stand up for the needs of each other, they are able to use the political trust within their own communities to enhance the human rights agenda and contribute to confidence building. This is the main learning from the Religious Track, which could be shared with others and also be applied in other conflicts and contexts.“ Stated Peter Weiderud, Director of the Swedish Institute Alexandria and the moderator of the RTCYPP. The Swedish Research Institute in Istanbul (SRII) was founded in 1962 with the primary aim of promoting Swedish and Nordic research about Turkey and the Eastern Mediterranean as well as other regions that are connected linguistically, culturally, or historically. The SRII organizes and hosts conferences, seminars and workshops, doctoral and master courses as well as regular lecture series on a wide range of topics. It is located on the same historic ground as the Consulate General of Sweden in Istanbul. A delegation of the Religious Track of the Cyprus Peace Process together with H.E. Bishop Porfyrios of Neapolis, representing H.B. 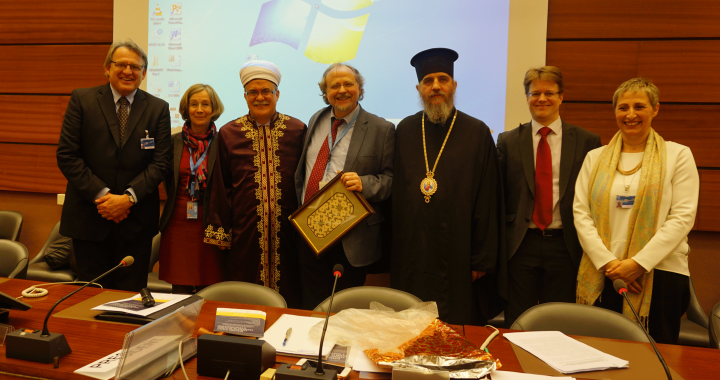 Archbishop Chrysostomos II and Dr Talip Atalay, Mufti of Cyprus concluded a successful trip to Geneva where on the 11th March 2016 the two religious leaders addressed the 31st session of the United Nations Human Rights Council at a side event on “Interreligious Communication, Freedom of Religion and Peacebuilding” together with Dr Heiner Bielefedt, the Special Rapporteur on freedom of religion or belief and Peter Weiderud, Director of the Swedish Institute, Alexandria. “One could say that the Religious Track has changed the roles of the religious leaders from being part of the conflict, to being part of a negotiated solution for peace” stated Ambassador Veronika Bard of Sweden in her opening remarks to the side event which was hosted by the Permanent Mission of Sweden to the United Nations Office in Geneva and related organizations in Geneva. Dr Heiner Bielefeldt in his concluding remarks said that he had “benefitted enormously” from the efforts of the Religious Track in Cyprus where he could “derive inspiration and hope”. The session concluded that the interreligious dialogue for human rights and peace in Cyprus must go on and should further broaden its ownership in Cyprus; the perspectives towards the region and self-understanding of diversity in Cyprus. The religious leaders and the Office of the RTCYPP took the opportunity to publicly pay tribute to Prof. Dr Bielefeld, whose term as Special Rapporteur comes to an end this summer. The Special Rapporteur accompanied the work of the Religious Track since his country visit to Cyprus in 2012 with his encouragement, challenges and support together with the United Nations Office of the High Commission for Human Rights. On the 10th March, the delegation attended meetings and presentations with the diplomatic community, human rights defenders and victims marking the 30th Anniversary celebrations of the mandate of the Special Rapporteur on freedom of religion or belief. The facilitators of the RTCYPP had the opportunity to address the 53rd session of the Commission of the Churches on International Affairs and give an update on the current situation in Cyprus and the efforts of the religious leaders in this regard. On 8 March 2016, Office of Religious Track of the Cyprus Peace Process hosted the meeting of the religious leaders of Cyprus with the Special Representative for Religion and Global Affairs of the US State Department Dr. Shaun Casey at the residence of the Swedish Ambassador Mr. Klas Gierow. 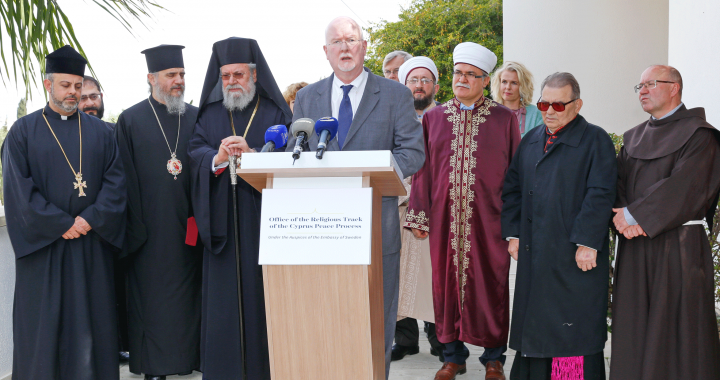 Special Representative Casey is in Cyprus to meet with religious leaders of Cyprus and the Office of the Religious Track of the Cyprus Peace Process under the Auspices of the Embassy of Sweden and learn about their work for peace and reconciliation. “Religious leaders are the guideposts for their communities in espousing values of respect, offering pardon, welcoming the stranger, and caring for one another. These values are shared across religious traditions and historically have served as the cornerstone of reconciliation,” stated Dr. Casey at the Press Conference following the meeting. “We had very fruitful, frank and interesting discussions with the Special Representative today and would like to express our appreciation to the government of the United States of America for their keen interest in the efforts of the religious leaders within the framework of the Religious Track”. Stated Peter Weiderud, Moderator of the Religious Track and Director of the Swedish Institute, Alexandria in welcoming Special Representative Casey. As part of his visit Dr Casey is also visiting holy sites and meeting with members of the religious communities and civil society.